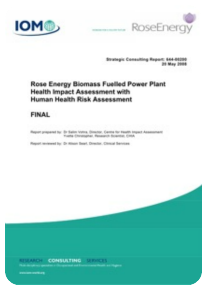 I was project managed and conducted this Health Impact Assessment incorporating a Human Health Risk Assessment of a proposed biomass (poultry litter) fuelled power plant. Power plants and incinerators are in a class of developments that are almost universally unwanted by local residents. The cumulative lifetime cancer risks from the emissions of the power plant, through direct and indirect exposures, are so extremely small as to be effectively zero when considered alongside the other more important personal, lifestyle and social factors that influence health and wellbeing. Similarly the cumulative hazard levels from the emissions of the power plant, through direct and indirect exposures, are less than 25% of the safe or tolerable/acceptable exposure level. The plant is likely to have a moderate positive impact at regional level and a minor to moderate negative impact at the local level. The intensity of the negative impacts will be dependent on both the proximity of residents to the proposed site and how well the mitigation measures identified in this report, and in the EIA, are implemented. Overall, the major negative health impacts on local people are likely to be nuisance level and quality of life impacts. These are important considerations but they are not effects that are likely to cause disease or ill health in local residents. The dioxin risks are wholly due to long term background exposures during childhood and across the whole lifetime as a child and adult. This is because of the relatively much higher background levels in air, water and soil in the area compared with the lower level of additional exposure generated by the proposed power plant. Therefore, though the breast feeding infant would be slightly more vulnerable than a young child the health risks of exposure over one year is generally less than that for the child receptor/exposure scenario which was estimated over six years. The child receptor was therefore considered to provide the more accurate assessment of the potential risks to infants and young children. Over 95% of the dioxins in breast milk is from background exposure of the mother through ingesting food and the body burden of dioxins associated with her body fat. The additional exposure from the facility via breast milk is therefore very small compared to this and hence the additional health risk over less than one year of breast feeding is also very small. In the context of the proposed Rose Energy Power Plant, the risks of exposure to TSE/BSE and infection by prions is so small as to be effectively zero. This includes the case of spillage of meat and bonemeal onto local roads as the most likely source of contamination in such an event would be via groundwater and direct contact. The Environment Agency DNV assessments found the potential health risks to be very low for all environmental pathways at a time when BSE/prion exposure was very high. Similarly, the SEAC Statement on incineration and the modelling research in the context of Ireland also identified that there was no risk of prion exposure from a modern incineration process. Overall, these three sources provide robust and credible evidence that there would not be any adverse effects on the health of local residents from TSE/BSE/prion exposure from the meat and bonemeal fuel used by the proposed power plant. READ THE ADDENDA AND THE FULL REPORT BELOW.